After two decades, Madhuri Dixit and Sanjay Dutt are back together on-screen in Karan Johar's magnum opus Kalank, and Dutt can't stop praising his former lady love. They have worked in many films together in the nineties, notably in Saajan (1991) and Khalnayak (1993), where their chemistry was legendary. They were also rumoured to be dating and were planning to get married, before their break-up. After a gap of 21 or more years, Madhuri Dixit and Sanjay Dutt are back together on screen — to be seen in Karan Johar's magnum opus Kalank. 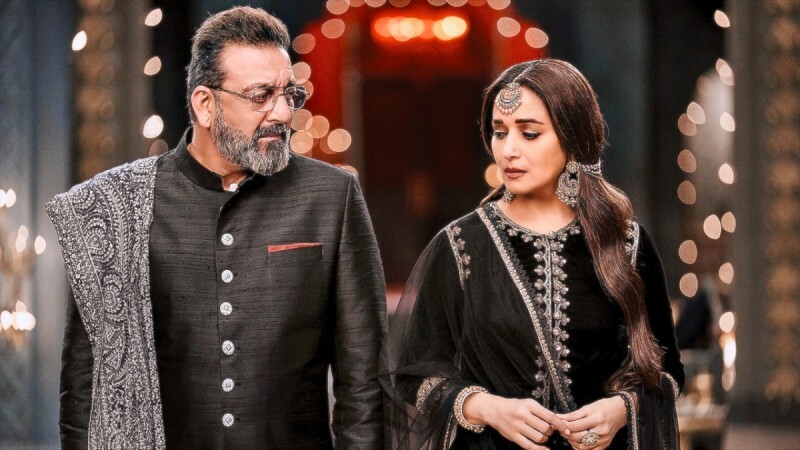 Looking at the promotion of Kalank where both actors playfully addressed each other as 'Ma'am' and 'Sir', and reading Sanjay Dutt's interview with a leading daily, we can't help but wonder: Is Sanjay Dutt still in awe of Madhuri Dixit? The Khalnayak of Bollywood was all praise of his former leading lady in the interview with Bombay Times, calling her "dynamic" someone who still looks good, and an in-form actor. "We have worked together in so many films, so to come back and work together after so many years was an amazing feeling," said Sanjay Dutt, clarifying, "At least, for me." Going on to praise how Madhuri Dixit has matured as an actor, Dutt gushed, "She was a fantastic actor then, but to progress and become the kind of actress that she is now, is commendable. She is so dynamic. Everyone gets older, but to still look the way she does, and continue being in such form as an actor is something else." The two actors only have one scene together in Kalank. And even that has left Sanjay Dutt in awe of how Madhuri still has command as an actor. Dutt told DNA about working with Madhuri Dixit again after 21 years, "Working with her is a pleasure. What is the time frame that we hadn't met or seen each other? Two decades, perhaps a little more. Madhuri is such a great actor. I've done many films with her — Thanedaar (1990), Saajan (1991), Khalnayak (1993), Mahaanta (1997)... I can't even recall in one go. So, to work with her again in that one scene that we did together in Kalank was amazing." Praising Madhuri's acting talent, he said, "She's got that command as an actor. It's a pleasure to share screen space with her after so many years. So much has gone past, people have matured. She herself comes across as such a matured actor." Admitting that he made some bad choices as an actor in recent times, like Bhoomi (2017) and Saheb, Biwi Aur Gangster 3 (2018), Sanjay Dutt is all set to restore his career. After Kalank, Dutt will also be seen in Yash Raj Films' Shamshera where he stars as the antagonist opposite Ranbir Kapoor. He also has Sadak 2, a sequel to the cult Sadak (1991) that starred Pooja Bhatt and him, and then Ashutosh Gowariker's period drama Panipat and a film called Bhuj: The Pride of India. Now, wouldn't it be great if there were more movies with Sanjay Dutt and Madhuri Dixit in the future? A Khalnayak 2, perhaps, Mr Subhash Ghai?